Soak the mushrooms for 4 to 6 hours. In a fryer over low heat melt the cocoa butter. Add the chopped onion and sautée a little. Add the drained mushrooms and vegetables and continue sautéing over low heat until they are cooked. Add the corn and soy sauce and mix well. Turn off the stove and add the chopped parsley, the brewers yeast and chia seeds and mix well. Serve warm. 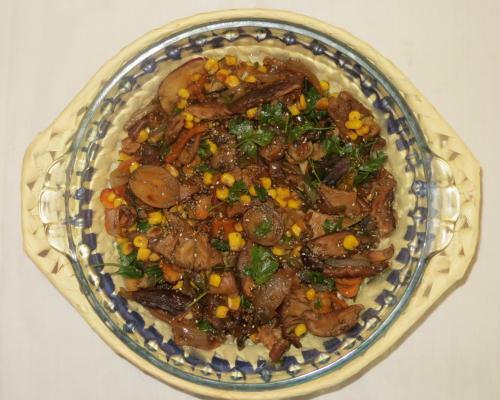 Delicius with couscous or pasta, cooked in the water in which the mushrooms were soaked. Cocoa butter is a healthy fat which gives a very pleasant flavor to this easy and nutritious recipe.